Workshop with Naples Garden Club: Elegant Holiday Design—a Hands-on Workshop. On December 6 from 9:30 am to 11:30 am you can create your own holiday decorations. Choose between creating a long, low horizontal arrangement or a tall vertical design using long-lasting greens and flowers. You can also add an innovative combination of tropical materials and more temperate flowers to your green-and-white color palette to enhance your holiday décor. Then take your design home to enjoy! For more information or to register visit this page. 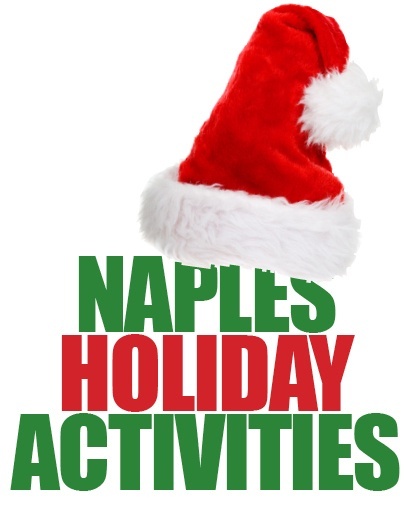 Holiday on the Bay—Naples Snow Show: December 6 @ 2:00 pm - 5:00 pm is the time to enjoy a festive snow show and take delight in holiday entertainment including complimentary photos with Santa, stories with Mrs. Claus, holiday carolers, dance group performances and extraordinary shopping and dining all evening. The show starts at 7 p.m. (and at 4 p.m. on December 24th). Click here for more information. Coney Island Christmas: December 7, 7:30 PM to 9:30 PM. Pulitzer Prize-winner Donald Margulies created this funny and heartwarming holiday play about Shirley Abramowitz, a young Jewish girl during the Depression, who is cast as Jesus in her school’s Christmas pageant, much to her immigrant parents’ chagrin. As Shirley, now much older, recounts the memorable story to her great-granddaughter the audience is captured by the merriment, nostalgia and music of the era. Coney Island Christmas captures what it means to be an American during the holidays. Click here for more information. Nature Wreaths Workshop on December 10 from 2:00 PM to 3:30 PM: Here’s your chance to bring a little of the outdoors inside with a creative nature wreath. You can make a wreath for the holidays or something that can be displayed year-round. Wreaths and a wide variety of natural materials will be provided. Bring yourself and a creative mind! The even will be held at FGCU Kapnick Center Buehler Auditorium at Naples Botanical Garden. You can register in person at the Chabraja Visitors Center or by phone (239.643.7275) during business hours. Or you can register by email LLL@naplesgarden.org during non-business hours. Santa Stroll 5K Glow Run on December 17 from 5:00 PM to 8:00 PM: Runners and walkers can take to paths lined with thousands of lights and dozens of lighted characters. Add to the excitement and fun by running or walking with glowing decorations. Participants will also help to decorate beautiful Lake Avalon with their shining movements as they compete in the professionally chip timed 5K or traverse the sparkling paths in the non-timed non-competitive walk. Walkers can walk either one lap or two laps of the 1.5-mile path. More information is available here. New Year’s Eve Fireworks (Naples Pier) blog post. The Ride of Distinguished Gentlemen on January 1 from 7:30 AM to 10:00 AM: Don’t let the name fool you. This event is open to all genders! There is no charge for this ride, however there are “strict rules” that we strongly recommend you obey, including the speed rule that stipulates a speed 20-22MPH ridden at a conversational pace. A second warning for excessive speed will result in violators being required to purchase a round of beers post ride. Click here for more fun rules and additional information. 5the Annual Big Swamp Smoke-off, January 6 from 5:00 PM to 8:00 PM: Join the large contingent of the country’s top cook teams arriving in Naples to compete as the top cooks. This two-day event will include activities for the Family such as partaking in the People’s Choice Award by sampling all the professional teams tasty pork and place your vote, Craft Beer Tasting and Face Painting, Bounces, Bungees, Games for the Kids and other vendors. Come hungry! On Friday, January 6 the gates open at 5:00 PM. There are kids’ activities until close. There will also be music on the main stage until 8:00 PM. On Saturday, January 7 the gates open at 10:00 AM with kids’ activities all day and music from 10:00 AM until 5:00 PM. Click here for more information.